You can find the PDF pattern on the Patterns page. I’m a huge sucker for cute crochet. Particularly cute crochet with a bit of an edge. So when I found Brenda K.B. Anderson’s Beastly Crochet: 23 Critters to Wear and Love, I was totally smitten. The book is full of patterns for purses, stuffed creatures, slippers, baby clothes, and more, all featuring adorable monsters, skulls, vampires, robots, and other delightful critters. My first creation from the book is a hilarious candy monster, with a particular penchant for chocolate. He’s an interesting type of design that I haven’t encountered before. He’s crocheted in the round, like any amigurumi, using a wool yarn, and then felted in the washing machine until the fabric is dense and can stand up on its own. Once the felting is complete, a hole is cut for the mouth turning him into an adorable container. It never occurred to me to use the hollowness of amigurumi as a feature rather than simply a repository for stuffing. Obviously, this would only work with felted fabrics as the felting helps prevent the cut yarn from unraveling, but I think this technique opens up a lot of possibilities for purses and bowls. And who doesn’t want an adorable monster sitting on their desk guarding their afternoon snack? I just hope he’s willing to share! When the idea was first pitched in a meeting to create a game where the player rolls up the world to make new stars, do you think anyone actually thought it was a good idea? Crazily enough, it turns out it was. Katamari Damacy is certainly one of the oddest, and yet most enjoyable, games I’ve played. 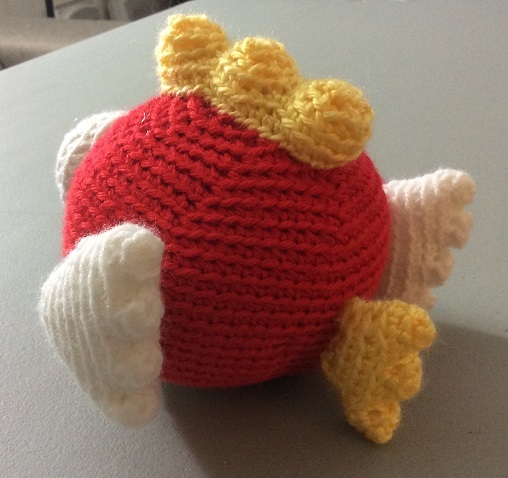 So next up in my crochet amigurumi adventures is the Katamari Prince. I’ve seen a couple of patterns for a Katamari Prince, but the finished plushies were all fairly small. I wanted mine to be bigger and hence this pattern was born. He’s around 10 1/2 inches tall when he’s sitting (not including his antenna) and 20 inches if I include both the antenna and legs. 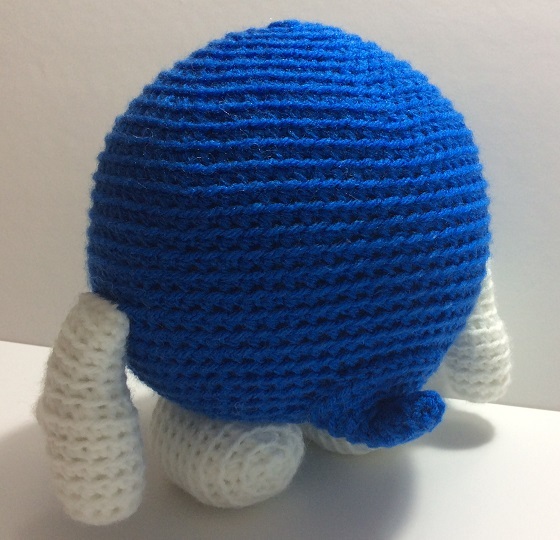 I’ve been planning to make one of the adorable magnetic katamari balls for awhile, but now I’m worried if I do, that this little fellow will roll up my apartment. 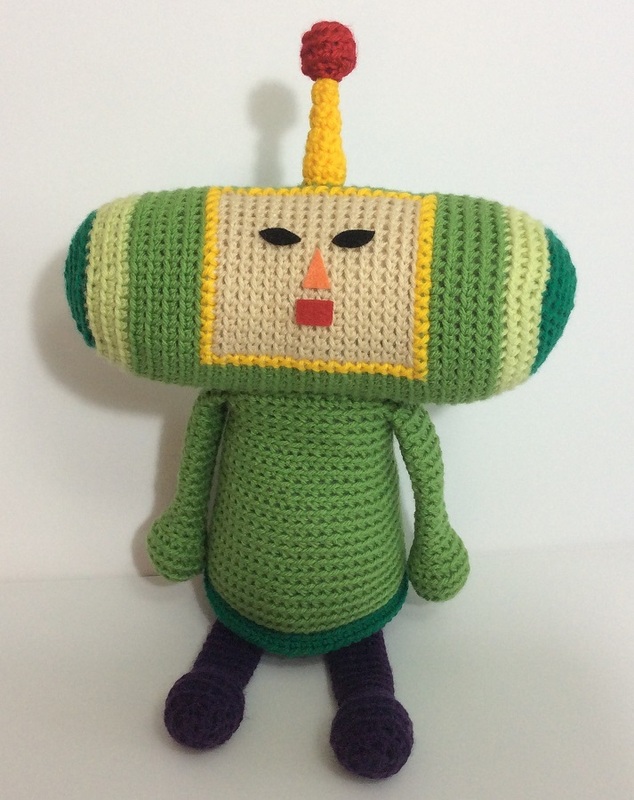 Want your own Katamari Prince? The pattern can be found on my pattern page. I’ve been on a bit of an Adventures of Lolo kick lately. For those who don’t know it, it’s a series of puzzle games for the NES from the late 80’s and early 90’s. As a kid I repeatedly rented these games from Bandito Video. (Anyone else remember these stores? Apparently there was still a location in Barrie, Ontario up until two months ago). These games seemed pretty simple on the surface but like many puzzle games, got dasterdly hard as you progressed. I’m thrilled to see that Nintendo is finally planning to jump into the mobile game market and hope some classic games will get a mobile revamp. This series in particular would be well suited to touch controls, and they still hold up as solid puzzle games. 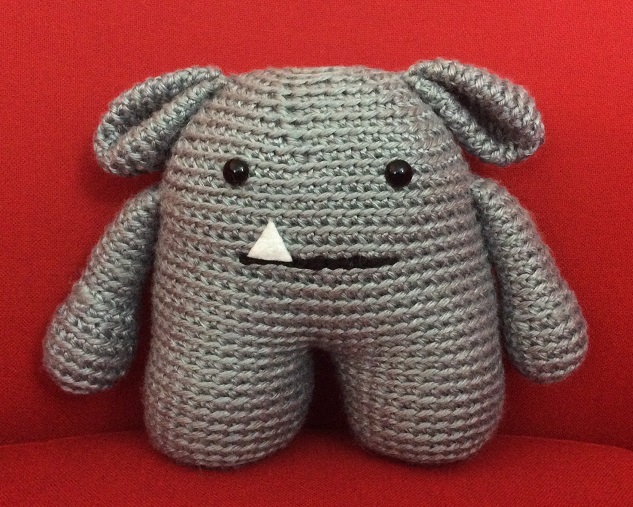 I’m also working on developing my amigurumi design skills and delving into the world of pattern writing, so Lolo, with his simple shapes and limited colour palette seemed like an obvious choice. I’ve added a new Pattern section to my blog and the pattern for this crocheted cutie can be found there. Please let me know what you think. I’m always open to questions and suggestions. And if you do end up making him, I’d love to see a pic! Here’s my first attempt at designing my own amigurumi. 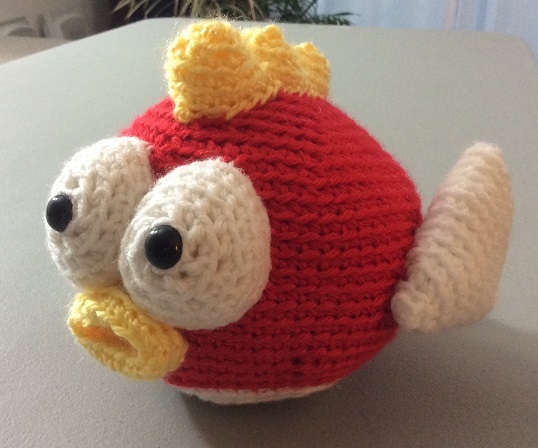 It’s a Cheep Cheep (flying fish) from Super Mario Brothers. I’m super happy with how he turned out and completely in love with creating my own crocheted plushies. I fully intend to write up and share the pattern for this guy, but didn’t keep the best of notes while I was creating him, so it may take me a bit to get it done. I hope you love him too! 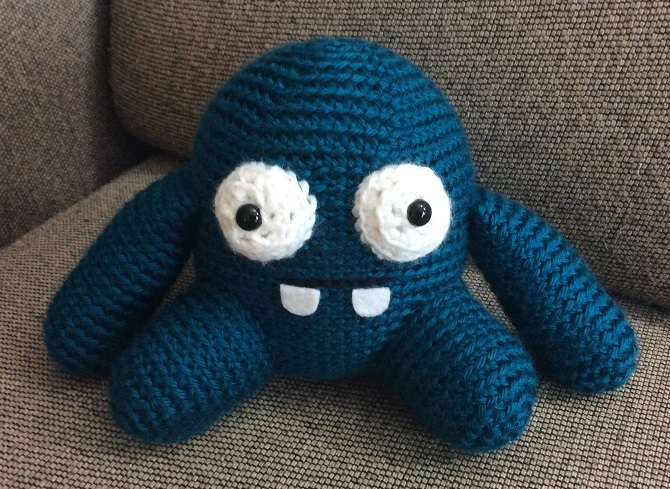 I’ve finished working my way through the Amigurumi: Design Your Own Monster class on Craftsy. Overall the class was excellent. Even though I’m not new to amigurumi I learned a lot from this class and found it to be a lot of fun. My only complaint is that I wish it were longer. It only covered very basic shapes and shaping, I’d love a follow up class that taught some more complicated amigurumi designs. Since I’ve made crocheted plushies before I didn’t bother to crochet along with every monster demonstrated in the course (I only have so much shelf space after all) but I had to make the final monster as he’s one of the cutest things I’ve ever seen. This class really inspired me and gave me the confidence to start creating my own amigurumi designs. I already have a few in the works that I can’t wait to share! 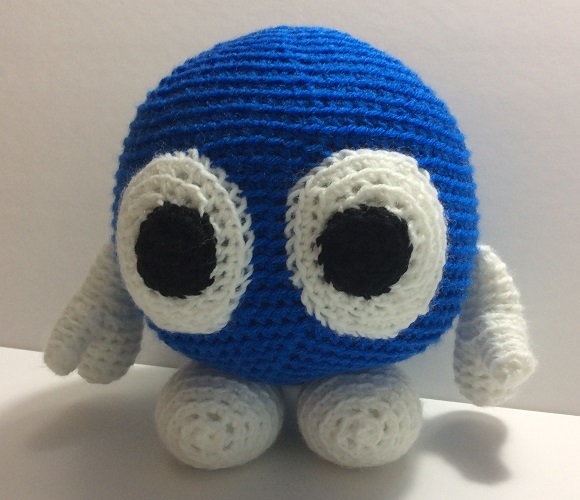 I’ve been working my way through the Amigurumi: Design Your Own Monster class on Craftsy. If you are unfamiliar with Craftsy, the site offers a large number of video classes on a variety of crafty topics. Each course provides a number of hours of video instruction as well as a discussion forum where class participants and instructors can ask questions or share ideas. I’ve bought a few courses already and can say that they have all been excellent quality and taught by very knowledgeable instructors, but so far, this amigurumi monster course has been my favourite. I find the classes a little on the expensive side, but there are regular 50% off sales, so keep a look out for one of those. Amigurumi: Design Your Own Monster is taught by Stacey Trock, author of Crocheted Softies and Modern Baby Crochet, and the brains behind FreshStitches. Stacey is hands down one of the most delightful and entertaining video instructors I’ve seen. She has the perfect combination of quirk, humour, and knowledge, and clearly loves what she does. The aim of the course is to learn how to crochet the basic shapes used in amigurumi and how to combine them to design your own creations. Stacey demonstrates her design process from start to finish making this the only amigurumi resource I’ve found so far that covers every aspect of amigurumi creation, right from starting with a sketch to creating the finished plush. Here’s the first little monster you make in the class (I’ve named mine Monty). This guy is a pretty basic introduction to amigurumi intended to teach how to crochet the basic cylinder most amigurumi is based on, and a couple of different techniques for stitching together the pieces. Watch for more monsters to come as I keep working my way through this course.